Windows XP/Vista; Intel Core 2 Duo 1.8Ghz or higher (AMD 2GHz or higher) 256 MB Video RAM (DirectX 9.0); Blu-ray DVD player and HDCP compliant screen for Blu-ray disc playback. With Windows Vista now having the capability to playback DVDs directly via Windows Media Center and Windows Media Player, it makes one wonder whether it is actually worth spending additional money on third party software such as Cyberlink Power DVD 8 Ultra; particularly when you also consider that the next incarnation of Windows, Windows 7, will also have built in support for playing Blu-ray movies. As more and more features are added to the Windows operating system, giving it a more truely multimedia feel, it begs the question of how long will it be before applications such as Intervideo’s Win DVD and Cyberlink’s Power DVD become totally obsolete? Power DVD 8 comes in three versions: Standard which is the entry level product; Deluxe and finally Ultra. It is only the Ultra version that supports Blu-Ray, AVCHD and SMPTE VC-1. Power DVD 8 Ultra has a clean and crisp web browser style interface to complement its high definition disc playback, and as well as supporting Blu-ray BD-ROM and BD RE discs, comes complete with Dolby Digital Plus, Dolby True HD and DTS-HD audio formats. If you are a real movie buff you are going to want information on the film you are watching. This is provided by PowerDVD 8’s internet based MoovieLive feature. MoovieLive is user interactive and enables users to add reviews and general movie experiences to a database which can be accessed by all subscriber’s to the MoovieLive site. Unfortunately this information isn’t always as good as one would expect it to be and, currently, the information on newer movies is somewhat sparse. Perhaps a better option would have been to have linked directly to an online movie database where one could get in-depth details of the film, such as cast and plot etc. This is the part of the software where you can really let your hair down and have some fun with movies by creating your own ‘alternative’ version. By adding animated graphics, audio clips, voice-overs and subtitle text overlays you can completely change selected scenes within the movie you are watching. Because the remix is simply and overlay your original movie is not actually touched. You do, however, have to have the original movie disk in the PCs DVD drive whenever you want to use your created remix overlays. You can also upload and share your creations on MoovieLive and even, if you wish, download scenes created by others. PowerDVD 8 Ultra is easy to use and a must have application for any movie buff who wants something better than the standard movie player such as Windows Media Player. PowerDVD 8 Ultra does, however, come at a premium price and, sadly, has no native support for HD DVD. 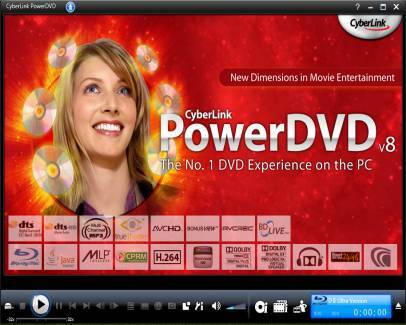 We were suitably impressed by PowerDVD 8 Ultra. Our only disappointment, however, being with the notification that a 104 MB upgrade was available immediately after we installed and launched the application. While install of PowerDVD 8 Ultra went smoothly it was a bit over the top to expect to have to, basically, download and reinstall the application again in the form of an upgrade package.